Just after I posted the blog, We Have A Pope, my friend, Steve Lucanic, sent this email. Based on your below blog, I have sent you a dvd which should continue to keep you inspired. It is one of my favorite movies because of the message it sends. Watch for it from Amazon! 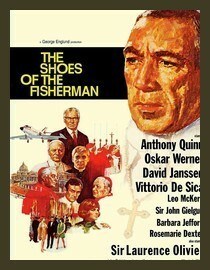 A few days later, I received a copy of The Shoes of the Fisherman. I decided to hold it for a time that Christina and I could watch it straight through - it's 162 minutes, so that required some planning. As it worked out, that time was this evening. I've already sent two "thank you" emails to Steve, and now I'm recommending his gift to you. Follow the link, and gift yourself with a copy, or, if you are an Amazon Prime member you can stream it at no charge. No matter how you obtain it, don't miss it, and be prepared for goose bumps at the way the forty plus-year-old movie depicts the events of today. But, most of all, as my friend Steve pointed out, you will be inspired - that's something that is never out of style.